– Do monitor baby’s breathing at all times. Make sure a young infant’s chin is off of his or her chest and the back is supported. – Do return baby to an upright position after breastfeeding. – Do watch your step, as your balance can be affected while wearing. – Do be aware of your surroundings, as the two of you take up more space than you do alone. Be particularly mindful of doorways, furniture corners, or car doors. – Do pay attention to what baby can reach from his or her new vantage point! – Do make sure that baby’s face is visible at all times and that it does not become covered by the fabric of the carrier. – Do include baby in day to day activities such as cleaning, laundry and prep kitchen & cooking work, however not around heat such as cooking on the stove. – Don’t perform any activity that requires the use of safety equipment. Some examples might include bike riding, boating, or downhill skiing. – Don’t participate in physical exercise that involves excessive jumping or shaking. 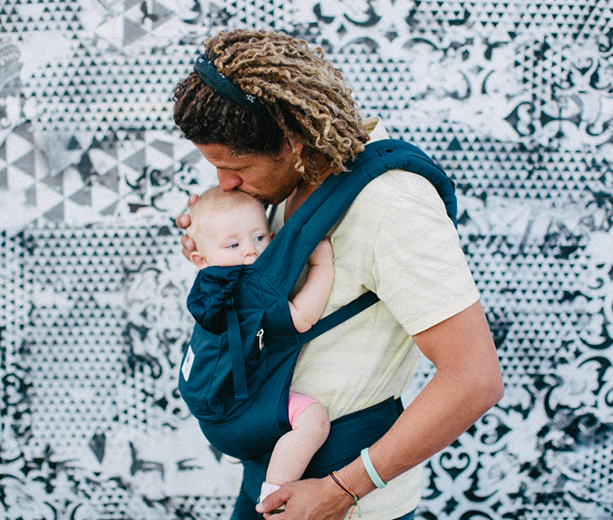 A walk or hike is a great babywearing exercise; however, jogging or trampoline need to wait.